Cancer refers to a complex and heterogeneous group of diseases characterized by the uncontrolled and disorderly proliferation of cells, which often acquire the ability to invade other tissues. Cancer usually originates in somatic cells which, as a consequence of a series of genetic mutations, evade the mechanisms regulating tissue homeostasis, such as cell-to-cell contact inhibition, differentiation signals and cell death induction. The mutations responsible for tumor transformation concern two main group of genes, known as proto-oncogenes (stimulators of the cell cycle) and tumor suppressors (repressors of cell cycle progression). These functional alterations can occur as a consequence of single nucleotide mutations, but they can also be caused by larger modifications in genetic material, such as insertions, deletions, duplications or translocations of a chromosomic fragment. These abnormalities in cancer cells can be used as tumor biomarkers. The quantification of changes in gene copy number or gene re-arrangements is critical to our understanding of tumor biology, hence the importance of genetic tests based on molecular cytogenetics profiling. Figure 1: Labeling DNA probe for FISH analysis. Fluorescence in situ hybridization (FISH) is a cytogenetic technique used for the detection and localization of nucleotide sequences (DNA or RNA) within tissues or cells. FISH can be use for "mapping" the genetic material in human cells, providing information on the location, length and number of copies of specific genes or chromosome portions. It requires the synthesis of a fluorescently-labeled probe, which is a nucleic acid sequence bound to a fluorescent reporter molecule, which will then bind (hybridize) to a specific target sequence. FISH probes can be labeled by various methods (e.g. nick translation, random priming), starting from different nucleic acids inputs, like genomic DNA/RNA, bacterial artificial chromosomes (BACs), or cosmids. The first step in the FISH process is immobilizing metaphase chromosomal spreads or interphase cells containing the target DNA on a glass slide. Next, both the DNA specimen and the FISH probe are denatured by heat. When the probe is in contact with the target genetic material, it will specifically bind to its complementary sequence on the chromosome. Hybrids formed between the probes and their sequence targets can then be visualized using a fluorescent microscope (Figure 1). In general, two types of FISH probes can be distinguished: the chromosome enumeration probes (CEPs or CENs) targeting the pericentromeric regions of chromosome and used to enumerate chromosomes; and locus-specific indicators (LSI) specifically recognizing genes of interest. FISH has several advantages over other classical cytogenetic techniques, such as G-banding karyotyping. First, it has a higher resolution (20-150kb vs 5Mb). In addition, FISH can be applied to both metaphase and interphase chromosomes, meaning that cells do not need to be cultured for several days before chromosomes can be prepared for analysis. This also implies that FISH is suitable for the analysis of different kinds of sample types including solid tumors and formalin-fixed paraffin-embedded (FFPE) tissues. Furthermore, FISH probes can be labeled with different fluorophores, allowing for the simultaneous monitoring of multiple sites. Thanks to its versatility, FISH can be used for the cytogenetic analysis of both solid tumors (e.g. breast cancer, non-small cell lung cancer, colorectal cancer) and hematological or cancer of the blood (e.g. leukemia, lymphomas, multiple myeloma). The detection of genetic abnormalities is useful not only for cancer, but also as a tool to analyze genetic predisposition and disease-specific information, and to predict a chemotherapeutic outcome. Lung cancer is the most commonly diagnosed and the leading cause of cancer-related deaths. In particular, the non-small cell lung cancer (NSCLC) accounts for ~80-85% of all lung cancers. Somatic mutations on EGFR and ALK genes are often associated to NSCLC. EGFR (Epidermal Growth Factor Receptor) is a class of tyrosine kinase receptors whose activity is deregulated in different types of epithelial malignancies (including lung cancer), as they play an important role in cancer cell proliferation, angiogenesis and metastasis. For this reason, different strategies to interfere with EGFR function are commonly exploited for patients’ therapy. Inhibitors of the tyrosine kinase activity of these receptors (e.g. erlotinib, gefitinib) are widely used in clinical NSCLC treatments. Unfortunately, because of the variety of genetic mutations underlying the EGFR dysfunction, some patients are insensitive to this type of treatment. Different groups of patients can indeed be distinguished based on the type of alteration carried by EGFR, such as gene amplification, deletion or single nucleotide substitutions, which can alter its activity in different ways (i.e. not via the tyrosine kinase domain). As a result, the EGFR copy number determined by FISH is one of the biomarkers used to select the correct therapy. FISH is commonly used to detect inversions or translocations in the ALK gene. The ALK gene is located on the short arm of chromosome 2 (2p23) and encodes for the transmembrane tyrosine kinase receptor. ALK should not be expressed in the adult lung. However, under pathological conditions, the ALK gene breaks and fuses its 3’ (containing the tyrosine kinase domain) with the 5’ of other genes. This event can lead to the uncontrolled activation of ALK downstream signaling pathways. The most common fusion occurs with EML4, because of an inversion on the short arm of chromosome 2. FISH is the FDA-approved method to detect inversions or translocations in ALK gene. Typically, probes targeting the 3’ and the 5’ region of the gene are labeled with different fluorophores: in negative nuclei, the colors will appear close to each other (often overlapping), whereas in cancer cells the signals will split apart as a result of the chromosome rearrangement (Figure 4). Figure 3: Representative view of ALK gene translocation detected by FISH. 5’ and 3’ regions of the gene are visualized with a green and a red fluorescence respectively. A. Wild type nucleus. B. Cancer cell nucleus, showing the characteristic probes split. C. Cancer cell nucleus, showing the characteristic probes split. A third probe can be used to define the chromosome rearrangement actually occurring. A third probe targeting the potential ALK partner could further confirm and define the chromosome rearrangement occurring in a patient (Figure 4C). Lung cancers harboring mutations leading to ALK hyperactivation can be treated with ALK inhibitors such as Crizotinib. This is the most common malignancy in women and the second leading cause of cancer-related death worldwide. Breast cancer is often characterized by abnormalities in receptor status, leading to an upregulation of cellular transduction pathways responsible for cell proliferation and survival. In particular, approximately 20-30% of breast cancer tumors are known to overexpress HER2/Neu, a member of the EGFR family. A common treatment in these cases is Trastuzumab, a humanized monoclonal antibody approved by the FDA in 1998 for the treatment of breast cancer. Its exact molecular mechanism remains to be elucidated, but this antibody likely prevents HER2 activation by binding to its extracellular domain. In addition, it seems to induce tumor cell lysis stimulating the antibody-dependent cellular cytotoxicity (ADCC). FISH, using an appropriate probe against HER2, can be used to identify extra copies of the gene, a sign that it is more likely respond to Trastuzumab treatment. Figure 4: Representative view of potential breast carcinoma cells. 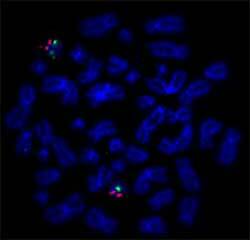 HER2 signal is represented in red; centromere 17 probe (green) can be used to enumerate chromosome number. A. HER2-non-amplified breast carcinoma: two centromeres 17 and two copy of the HER2 gene as expected. B. HER2-amplified breast carcinoma multiple detection for HER2. It is the fifth most common human malignancy and the second most frequently diagnosed genitourinary tumor after prostate cancer. It is a polygenic disease, meaning that it has been associated to multiple genetic anomalies, such as mutations in FGFR3, RB1, HRAS, TP53 or TSC1 genes. However, the initiation event is probably a mutation in the 9p21 region, containing the p16/CDKN2A gene. In addition, bladder cancer cells are characterized by an elevated degree of chromosome instability (CIN). 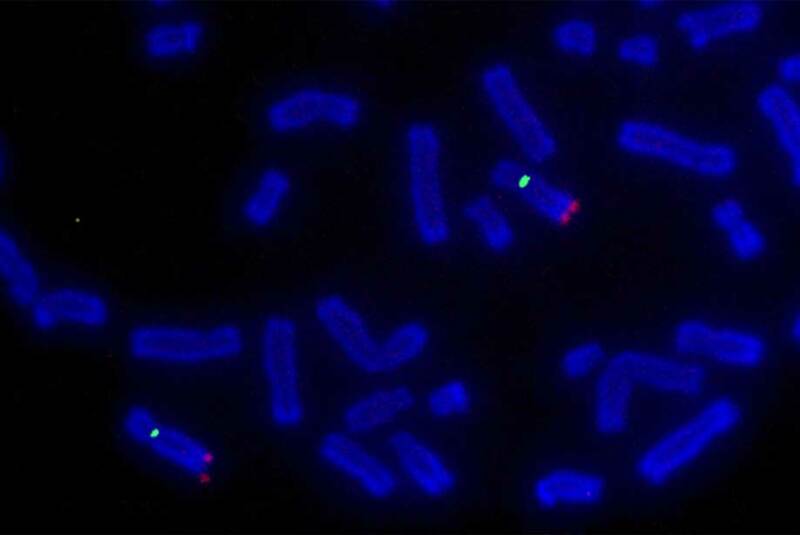 Dysfunctional chromosome duplication or segregation during mitosis cause DNA rearrangements and translocations, gain or loss of whole chromosomes (aneuploidy) or chromosome fragments. The resulting unbalance of the genetic material worsens after each cell cycle. The consequent genomic patterns can be related to the different stages of tumor development, with the more invasive forms displaying the higher number of cytogenetic alterations. The numeric and structural chromosomal alterations found in bladder cancer cells can be used as tumor markers. Specifically, simultaneous detection of copy number variation of chromosomes 3, 7, and 17 and deletion of the 9p21 region (containing p16) by FISH using four distinct probes is a common practice. This method is useful for providing information about cancer progression and recurrence. Analysis of hematological malignancies is one of the typical examples of the advantages of FISH for the analysis of samples characterized by a variable karyotype and a low mitotic activity. CLL is the most common leukemia in adults. It has not been associated with a specific recurring genetic alteration. Instead, similar to bladder cancer, a panel of different mutations has been associated with different severities of the disease and are used as predictive indicators of patient clinical course. FISH panels, in this case, often include probes to detect trisomy 12 and deletions 11q, 13q, and 17p. Deletion 11q, which in most cases concerns the gene ATM, is found in patients showing a fast progression of the cancer; trisomy 12 is associated with advanced stages of the disease, resistance to chemotherapy and shorter survival times; deletion 13q is the most commonly found and is in general associated with a more favorable prognosis; deletion 17p often includes a deletion of TP53 gene and corresponds to advanced stage of the tumor, with a poor survival rate. Enzo Life Sciences is a global leader in DNA and RNA labeling technologies. We offer a range of products for your Genomics and Cancer research needs. For a simple and efficient method for generating labeled DNA, please check out our Nick translation DNA labeling kit as well as a list of our SEEBRIGHT® fluorescent dye-dUTPs and our Allylamine-dUTP. Unsure whether to use biotin or digoxigenin for ISH probe labeling? We can help you there! Don’t forget to check Enzo’s spectra viewer for excitation and emission wavelength profiles of common dyes and our other fluorescence cell-based assays. While you’re at it, please check out our TechNote on the pros and cons of FISH, aCGH, and NGS and How to use allylamine-dUTP for FISH DNA probe labeling. For all questions and concerns regarding any of our products, our Technical Support Team is here to assist. Antifade mounting medium minimizes photobleaching of most fluorophores, dyes and fluorescent proteins.